I've just been outside talking to H while he waters the fruits trees and the pumpkins. I have high hopes for the pumpkins this year. We're growing them earlier and they should be harvested before the really hot and humid weather is upon us. Here are a few photos I took while I was out there. This is the back yard just 10 minutes ago. That's Alice there watching the chooks. She gently herds them up if they get too close to the fence or the fruit trees. 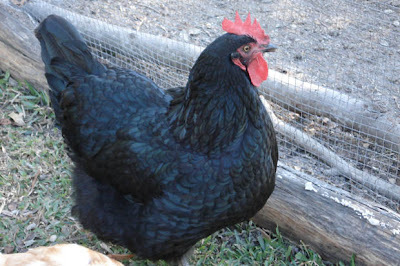 This is Rhococobelle, my favourite chook. Doesn't she have the most beautiful feathers. Finally, a part of the vegetable garden. Here we see a forest of cabbages and cauliflowers, bok choy, potatoes, lots of herbs and lettuce seeding in the distance. I love the spaciousness of your garden and Rhococobelle is gorgeous!! That's so beautiful. Excellent chook. Oh, my goodness, your garden is so lush and beautiful! What a nice harvest! And your chook is lovely as well. I *wish* we could raise them here, but we are not allowed in our neighborhood. :( I seek out fresh eggs from other folks, but I would love to have some "girls" running around here! Such a lovely garden. I'm wanting to have chickens in my backyard one day. How big is your garden? Hello Ali, yes, she is gorgeous. She very regal too, she always stands back and won't fight for food like the toehrs. She is one outstanding chook. Mrs Pivec, thank you. I hope your council changes its rules. Everyone should be allowed to keep a few hens. Hellp Jacran, thank you and welcome. 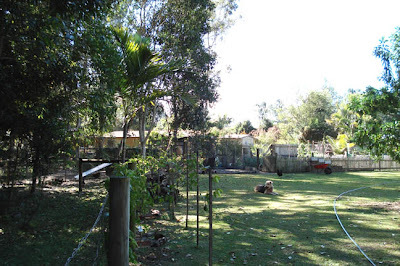 We have an acre of land and a small house on it. We have a picket fenced vegetable garden of about 150 square metres (I'm terrible with spatial measurements) and we also have fruit trees and vines in other parts of the back garden. Out the front we have some avocados and will be putting in some tomatoes in with the ornamentals this year. Splendid chook. 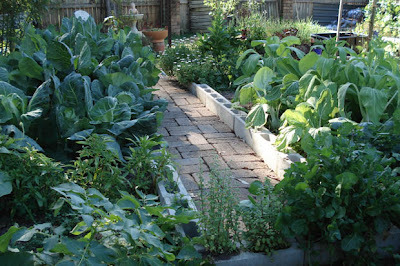 Splendid vegetable garden! I love your forest of veggies! I spent my teenage years in the rain forests of Central & South America. Your backyard reminds me of my childhood home(s). I live in the Virginia(U.S.A.) now. I'm having a terrible time growing greens because of cabbage worms. Yours don't look eaten up at all. Do you have that problem in your area, or do you have a secret for getting rid of them? Hello Alexandra, and welcome. We are only able to grow cabbage here for about 4 short months, then the insects descend and I refuse to grow anything that requires frequent spraying - even natural spray. The only thing I've ever used on cabbage caterpillars is Dipel. This is what my local organic nursery says about it: DIPEL- A pest control mainstay for organic growers worldwide. Dipel contains Bacillus thuringiensis, or Bt for short, it is highly effective and selective against most species of caterpillars. This biological control is a bacterial stomach poison for all caterpillars, which is mixed with water and sprayed onto foliage. It must be ingested by the actively feeding caterpillar, which dies 3-5 days later. It is totally safe to beneficial insects, bees, and mammals. Bt is broken down by sunlight within a few days, so repeated applications may be necessary.